Are you having disposable cameras on your wedding guest tables? 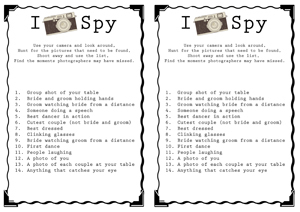 We have been to a number of weddings where disposable cameras were left on the guest tables for anyone to use, this is a great idea and allows you to see the wedding through the eyes of your guests, see the fun had by different tables and their take on the day! 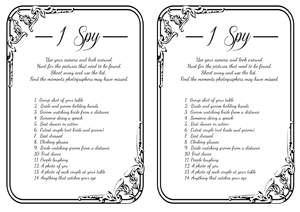 To give your guests some ideas of the photos you want them to take why not leave an ‘I Spy’ / ‘Scavenger Hunt’ list of photos for them to take of your wedding. This gives a purpose to having the disposable camera on the wedding table and you get the photos you want. Print it out on to A4 paper and cut in half. 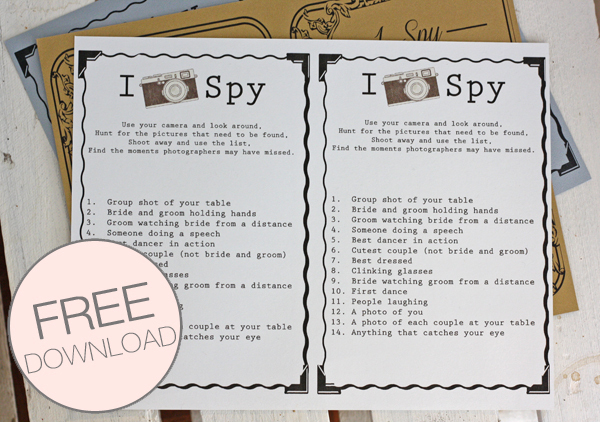 This will make 2 prompt sheets, lay one on each guest table next to the disposable camera and let your guests shoot away. 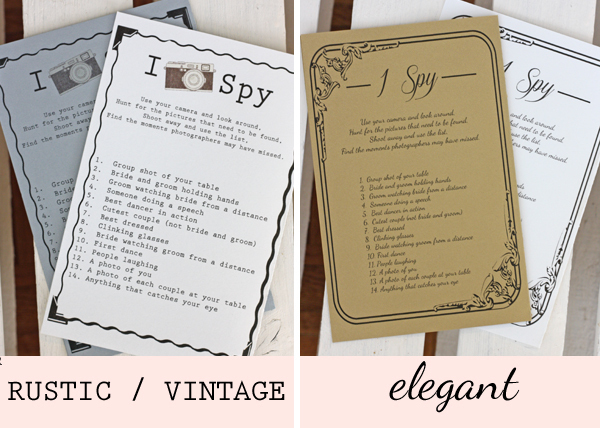 Depending on the style of your wedding you may prefer our vintage rustic wedding I Spy photo prompt sheet or our elegant I Spy photo prompt sheet. 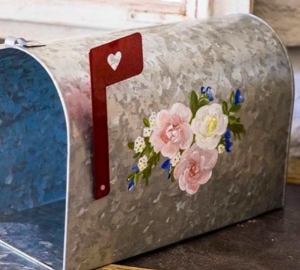 Our free downloadable photo prompt lists includes the following photo prompts for wedding guests, if you are creative you may choose to make your own photo prompts, add to our list below to create your own. Use your camera and look around, Hunt for the pictures that need to be found, Shoot away and use the list, Find the moments photographers may have missed. where did you get the cameras?